This 4-in-1 inkjet colour printer is designed to fulfill small office and home projects printing needs. The printer has 36 x 42 x 23 cm dimension with 6.6 kg weight. The printer’s control panel has a 5.6 cm monochrome LCD display, which also has function buttons and numeric keypad. This versatile printer supports Window and MAC OS and allows multiple media printing options. This Workforce WF-2650DWF printer uses a PrecisionCore printhead to ensure top-notch, laser-like performance. XL Epson Workforce WF-2650DWF ink cartridges can reduce the printing costs by 25%. Also, using the individual ink cartridges means that one need to replace only the empty ink cartridges, further reducing the maintenance cost. The printer has fast printing speed without compromising on the quality. Moreover, the 30-page automatic document feeder for multi-page, 1200 dpi scanning, faxing and copying offer ultimate convenience. Wireless connectivity ensures the flexibility in every small business needs. One can easily perform cloud scanning and email printing. Also, the WF-2650DWF is compatible with Apple AirPrint and Google Cloud print, which allows you to print seamlessly from smartphones and tablets. Multifunctionality printer to print, scan, copy, and fax the document. The Workforce WF-2650DWF printer does not have appealing looks but can fulfill all the business printing needs. The 4-in-1 inkjet printer can fax the documents along with print, scan, and copy features. The Wi-fi connectivity makes the printing process easier by providing multiple connectivity options. The printer has good paper handling capacity in the input cassette and also allows auto-duplex printing upto 30 pages. Moreover, the XL - Epson Workforce WF-2650DWF ink cartridges can reduce the maintenance cost for the one who performs frequent printing. How to resolve the generic errors that occur with your Epson printer? Unplug the power supply of the printer and then plug it again to check if power is not properly plugged in. Turn off the printer and ensure that no paper is jammed inside the unit. If you notice any jam follow the instructions mentioned in the user manual and take the appropriate action accordingly. Access the cartridge loading area and clean the ink collection cup if necessary to avoid any ink left out on the machine. What to do if hear any noise after ink installation and how to resolve it? For the first time when you install the Epson Workforce WF-2650DWF ink cartridges, the printer must prime its print head. You must wait until priming finishes before you turn off the product. If priming is not done properly it will use the excess of ink the next time you turn it on. If the print head of the printer stops moving or started making noise, and the charging process is not finished after 6 minutes, turn off your product for some time. Turn it back on and check to see if charging is still in progress. If it is still in progress, contact your nearest service center for help. Q. I am planning to buy a new printer. Print quality is of utmost importance to me. How is the print quality of the Epson Workforce WF-2650DWF printer? A. Critics have said that this printer gives good quality results. It gives a sharp and clean text. Graphics are also said to be well produced. Produced photos are clear, detailed and are of natural colours. Epson Workforce WF-2650DWF can produce prints at a resolution of 4,800 dpi x 1,200 dpi. If print quality is important to you, this printer is recommended. Q. Are there any special offers applicable on the purchase of the Epson Workforce WF-2650DWF ink cartridges? A. Yes, if you are a first time user of our website, you can apply the coupon code D10 at checkout to get a 10% discount on our already affordable price for Epson Workforce WF-2650DWF ink cartridges. If you like us on Facebook, follow us on Twitter or rate us on Google Plus, you will get a coupon for a discount of 5%. Q. Will there be any additional charges if I order Epson Workforce WF-2650DWF ink cartridges from this website? A. All our orders include very minimal delivery charges that start at €1.99 inc. VAT. The delivery charge of the ordered product may vary according to its weight. Q. If I miss the delivery of my Epson Workforce WF-2650DWF ink cartridges, what is the procedure? A. All our orders are delivered by Fastway Couriers. They will try to make two deliveries to your door. If the delivery is unsuccessful after two attempts, the goods will be returned to their central depot or to our warehouse. Any further delivery attempt after that will incur an additional charge of €4.95 inc VAT. You should contact us by telephone on 048 30833221 or email us at info@printerinkcartridges.ie if you miss the delivery of your order. Q. 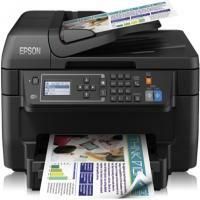 Does the Epson Workforce WF-2650DWF printer support printing from a mobile phone? A. There are various applications that Epson Connect, Apple AirPrint, Google Cloud Print that help in supporting printing from a mobile phone. Q. Can you tell me what interfaces are supported by the Epson Workforce WF-2650DWF printer? A. Epson Workforce WF-2650DWF supports network interfaces like Wi-Fi and USB.